People often speak about “General Liability” as if it is one coverage or one thing. General liability is a really broad term that refers to a package of coverages and coverage limits. These coverages and how they work are often misunderstood. Don’t take a shot in the dark when it comes to your general liability insurance coverage. 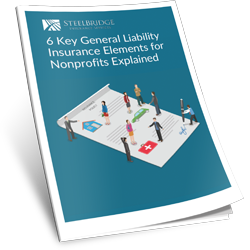 Download this guide to learn more about general liability insurance coverage and find out how you can better protect your nonprofit organization.